The Proper Study Of Mankind: Beware of the Others? New research published in Nature shows how biases towards members of our social group, and against those outside it, shape how generous we are to people and how we punish others for transgressing social norms. Humans are socially sticky: we bond into cohesive groups that commonly share a common identity and, often, similar values. This applies to social circles and local communities as much as to nationality and global religious and political affiliation. Such unity can encourage people within the group to pull together, to help one another when in need – in short, to get along. But there’s a downside to human ‘groupishness’: a mental division between members of the ingroup, to whom social and even moral obligations apply, and various outgroups, to whom they do not. People who live in different groups — geographical, social or ethnic — often treat outgroup members as ‘others’ (something viewers of Lost will be familiar with), frequently arousing enmity and stoking conflict. Note how groups really come into their own and pull together when pitted against other groups in the human speciality of war. The ingroup–outgroup distinction has the power to distort and bias our attitudes towards outgroup members in pernicious ways. These prejudices are played out locally and globally on a daily basis. When supporters of our football team brawl with the other team’s, we can easily blame our opponents on starting the trouble “They always cause a ruckus, don’t they?”). When our country is at way with another, we’re justifiably retaliating against military aggression (“We’re merely defending ourselves against those lunatics across the border”). Behaviour of ‘our people’ that is deemed to be tolerable can be judged intolerable or immoral or worthy of punishment when people of other groups do the same thing. The nature of human altruism (helping others), and the role of altruistic punishment (paying a cost to punish those that don’t help others) in establishing cooperation and a bases for sociality, are currently two of the most active areas of research in the behavioural sciences. Nearly every aspect of altruism and cooperation you can think of is being explored: how altruistic behaviour and willingness to punish non-altruists varies across societies with differing social systems (and also what universal trends underlie human altruism); how this variation relates to economic and demographic factors; how people respond to punishment for not cooperating, in both laboratory and real-world situations; the role of institutions that embody social norms of behaviour in maintaining cooperation; and what’s going on in the brain when we cooperate and defect in games of altruism with other human players. One of the most crucial findings of this research is the extent to which people will incur a cost to punish non-cooperators, and how powerful a force this is in eliciting cooperation from those tempted to defect. Studies with economic games across the world have revealed that the degree to which people will take a monetary hit to punish the unequal division of a sum of money (provided by the experimenter) increases as the split becomes more unequal. But this isn’t the whole story. Behind the general trend lurks much variation. Perhaps the most important way in which punishing behaviour varies is in the threshold of selfishness that elicits punishment from others. Players living in certain societies won’t punish until the outcomes of dividing money in economic games is grossly unequal, whereas other are much quicker to lay down the law. Some societies even have norms that lead to the punishment of unequal but hyper-fair splits of the money stash (so that the person controlling how much is given to another a player gives away more than 50%), which is something of a puzzle. The new study addresses a different question, one about altruism, altruistic punishment and groupishness. Do we respond to transgressions of social norms by our ingroup differently than violation of those same norms by members of an outgroup? Are we more forgiving of the former and harsher on the latter by virtue of their group allegiance? The answer looks like a qualified ‘yes’. Economists Helen Bernhard, Urs Fischbacher and Ernst Fehr took an experimental game called the third-party punishment game (3PPG) to Papua New Guinea to play among the indigenous people. In this version of 3PPG, games involved three players, A, B and C. At the start, the experimenter gave player A the sum of 10 kina (a good day’s wages in Papua New Guinea). Player A, also known as the Dictator, then had to decide an amount to give to player B, the Recipient (who simply received whatever the Dictator offered). Player C, the Third Party, then had a choice of imposing a punishment on player A (the Dictator) in light of what they had given to B (the Recipient). The punishment worked like this: when the Dictator received their initial 10-kina stash, the Third Part player was given 5 kina. The Third Party could then spend 0-2 kina to punish the Dictator, such that for every kina spent by the Third Party, 3 were lost by the Dictator. Players for the 3PPG were recruited from two distinct and non-hostile indigenous groups, who were then mixed together in four experimental conditions. In one set of games, players A, B and C were from the same group (ABC); in the others, either A and B (AB), A and C (AC), or B and C (BC) were co-members of the same group. What might we expect to see happening in these groups? Well, the ABC case is like many experiments that have revealed a willingness to punish those that violate norms of sharing — that is, Dictators that try to hog most of the cash for themselves are penalised by Third Parties, which leads many Dictators to revise their strategy (fairness pays more than greed when avarice is fined). So in the ABC game we’d expect to see high punishment by Third Party players for unequal splits and, anticipating this, Dictators would be more likely to offer more equal shares (punishing ‘sharing norm’ violators in this way helps maintain cooperation within groups in which people obey the norm of punishing the selfish). This prediction was fulfilled. But what of the other conditions? Well if social norms apply to our groups, and serve to promote cooperation within the group, then there’s little need to them to outgroup members. We should neither extended the obligations we feel towards our ingroup brothers and sisters to the outgroup, nor expect them to show us the consideration they show each other. In the AB condition, the Third Party (C), being from a different group the Dictator (A) and Recipient (B), has no obligation to punish the violation of the norm for sharing if the Dictator’s offer is unfair (the punishing norm applies to other members of their ingroup, to promote cooperation within their own group), and no interest in doing so either (if this act of punishment induces the Dictator to be more generous in future, that benefit accrues to the Third Party’s outgroup). A similar logic applies to the AC and BC groups: in both cases, the presence of the outgroup would seem to reduce the propensity to punish (in the AC condition, the Third Party (C), seeing that the Recipient (B) is an outgroup member, does not expect the Dictator (A) to apply the sharing norm to the Recipient, and so would not punish; in the BC condition, the Third Party player does not expect the Dictator to obey the sharing norm for a similar reason). The findings of the Bernhard et al. study don’t quite fit in with these predictions. Firstly, the same general pattern of punishment in response to unfair behaviour was the same across all conditions: people were more likely to punish as the split became increasingly unequal (to the Recipient’s disadvantage), and paid more to effect greater punishment the stingier the offer made by the Dictator (see figure). However, punishment was much stronger in the ABC condition than in either the AB or AC conditions. The real anomaly lies with the punishing behaviour in BC, which was, surprisingly and contrary to the expectation stated earlier, higher than in ABC. The difference between BC and ABC is that in the latter the Third Party is a member of the same group as the Dictator, and this fact leads to lower punishment of (or greater lenience towards) the Dictator. The level of punishment seen in ABC is perhaps a sort of baseline for within-group tolerance for norm violation, which becomes more muted (less tolerant) for outgroup members. 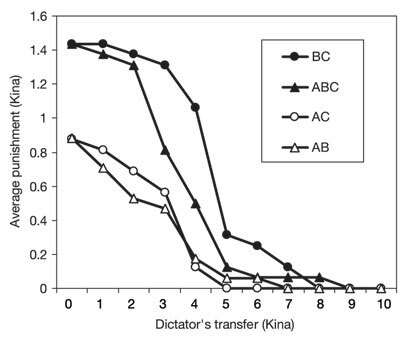 In the AB condition, which shows weak punishment compared with ABC and BC, it’s perhaps not so much that the Third Party is cutting the Dictator more slack, but is just not interested in incurring a cost to punish a violation of a norm among to people from a different group, among people of a different group. So Third Parties are more lenient when the Dictator who violates a sharing norm is a member of their own group. The results also show that Third Parties are more willing to punish Dictators who violate the norms for sharing when the Recipient is an ingroup member (irrespective of the whether the Dictator is an in- or outgroup member). By asking the Dictators in the games what their subjective expectations were for receiving punishment for making low offers to Recipients, the researchers found that players expected just what happened. Another way of putting it is that people are much more protective of ‘victims’ of norm violations (in this case being offered an unfair amount) if they are from the same group as the punisher (that is, will be more likely to punish the interloping Dictator). Bernhard et al. call this differential treatment of ingroup and outgroup members, or narrowing of altruistic and protective tendencies ‘parochial altrusim’. The flip side of the punishing behaviour in these games is how generous people were with other players in the first place. In general, transfers were higher when Dictator and Recipient were members of the same group, which the idea of parochial altruism would suggest. And Dictators were also less likely to make a truly egalitarian share with Recipients if the Third Party was a member of the Dictator’s group: they correctly anticipated that they’d be less punished than if they made the same offer to an ingroup rather than outgroup Recipient in the presence of the same Third Party. The results of this study are somewhat subtle, and require a bit of getting your head around to see what they might mean. The authors make a number of points in this regard. The first is to note that in all conditions, with mixes of ingroup and outgroup members, there was at least some sharing (altruism) and some punishment (altruistic punishment). In other words, players extended egalitarian norms, even if in a sometimes diluted form, to outgroup members. This is perhaps a problem for theories that see altruism arising through the selective extinction of groups that are less cooperative, and therefore less successful in the long run. Such a process sees differing groups as competing entities, and so they not be expected to include outgroups within sphere of social norms. The second relates to the unexpected finding of high levels of punishment in the BC condition (even higher than ABC). Without taking into account the factors that influence the balance of cooperation and conflict between groups, this finding is puzzling. One suggestion for it is that punishing an outgroup member who harms an ingroup member might enhance the security of the ingroup by sending out the message “You mess with one of us, you mess with us all”. Just like in gang culture, groups that are known to protect their own with a swift and aggressive response confer a degree of protection on each individual member, as no would-be outgroup aggravator want to bring trouble on their own head. Although the difference standards to which ingroup and outgroup members were held in this study had no harmful real-world consequences, they are a reminder of how, in one another’s eyes, we are not all equal: some — our ingroup — are more equal than others . This bias, stoked by religious, political or territorial disputes, can easily lead to a moral distancing of ‘them’, and justify whatever actions are perpetrated in ‘our’ name — the consequences of which we all too frequently read about. Perhaps being aware of this potentially dangerous proclivity for parochialism in the social and moral realms, we can take steps to resist the urge and develop an expanded, more encompassing, social and moral framework. Daddy, what did YOU do in the War on Evolution?